Three bicycle counters units are out of action in the Dún Laoghaire-Rathdown County Council area — the council say that they are working to fix all three. The units are on-street displays showing the amount of bicycles which pass over loops in the cycle lanes or cycle paths. The units are seen as a promotional tool, while the data is recorded and using for planning. One on the N11 is suffering what is described as an ongoing mechanical issue, the counter at Clonskeagh has a minor display fault, and the unit on the Rock Road is to be replaced after a motorist hit it. 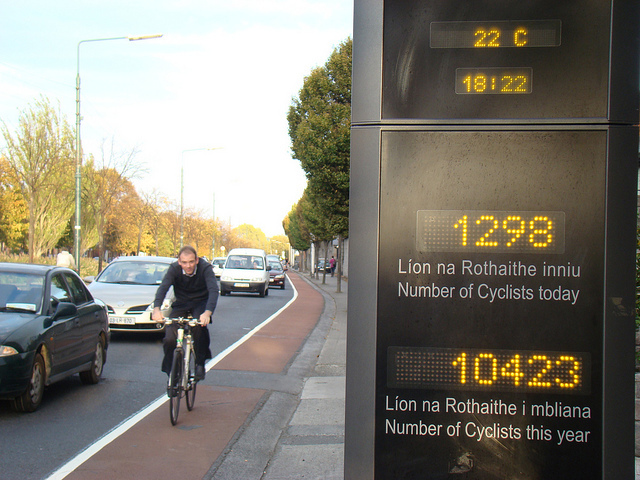 Last year we reported how these counters recorded a 20% spike in cycling on key south Dublin routes. As well as the counter locations mentioned above, the council also has counters without displays on the cycle path in Rock Road Park, and on the Metals greenway. Dublin City Council has just one counter which has a display unit — it’s on Grove Road (pictured below) along the Grand Canal where bicycles outnumber cars at the morning rush hour. Really quite an unacceptable delay in fixing these totem counters. If they were still logging data back to a server that would be fine but that doesn’t seem to be the case with N11 site. Why is it taking so long to repleace the Rock Road unit? It’s months since it was hit by a vehicle. Remember the Copenhagen adage ‘If you don’t count us then we don’t count’. FYI, the counter on Grove Road has also been out of action for a couple of months (since at least November I think).